Oliver Brody, whose partner used the end-of-life law to hasten her death, speaks in support of the law to the Senate Health and Welfare Committee. 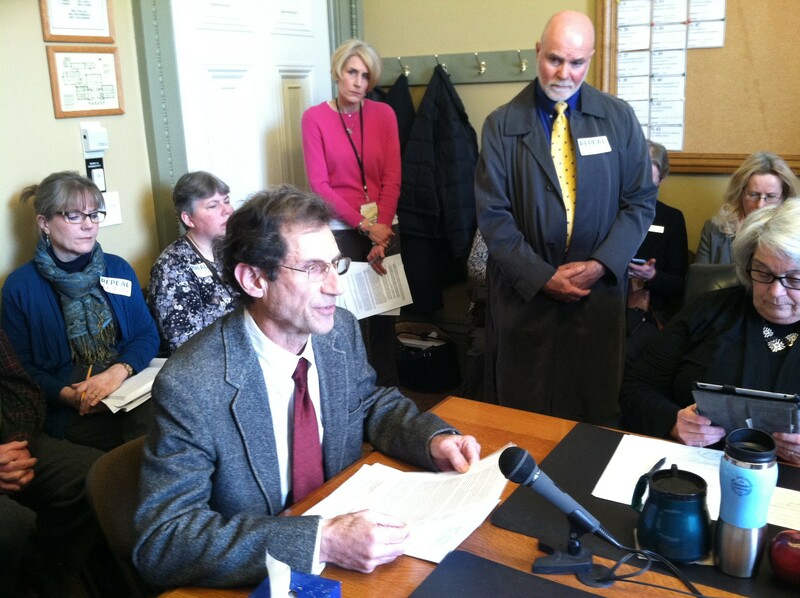 A Vermont Senate committee heard limited testimony Wednesday on the state's aid-in-dying law, and its members plan to stand clear of extensive changes to the controversial 2013 measure. “We’re just not going to open up the bill to amendments,” said Sen. Claire Ayer (D-Addison), chair of the Senate Health and Welfare Committee, after the hearing. She seeks to limit the scope of any changes to a law that some would like to repeal. Those with concerns about the law said it was clear that Ayer’s committee was interested in hearing only what members wanted to hear. “The purpose of today’s hearing was to reassure them that everything was going fine and to not ask the hard questions about what they don’t know,” said Lynne Cleveland Vitzthum, an opponent who represents the Vermont Center for Independent Living, a disabilities advocacy group. The five committee members asked few questions of the dozen witnesses. Noticeably absent were questions about the law’s impact on doctors, hospice nurses, pharmacists and others who are involved. The law, passed by a narrow margin after months of wrangling, allows terminally ill patients to seek a prescription for a lethal dose of medication to hasten their own deaths. Doctors have reported writing six prescriptions since the law was enacted in May 2013, Health Commissioner Harry Chen said. Advocates say three people ended up using the prescriptions to end their lives. If lawmakers take no action, several of the law's safeguards are set to expire in 2016. Those include provisions that supporters of the law want kept, such as requirements that patients make multiple requests for the drugs, that they have a 15-day waiting period and that they get a second medical opinion. Without those safeguards, many doctors would be unwilling to participate, said Dr. Diana Barnard, medical director of the palliative care program at the University of Vermont Medical Center. She supports the law. Ayer made it clear she’s interested only in tweaking the law to ensure that those requirements remain. As Vitzthum tried to urge the committee to consider the dangers the law poses to those with severe disabilities, Ayer shut her off. “We had this testimony last year,” Ayer interrupted. She later apologized to Vitzthum and allowed her to continue speaking. Vitzthum, a former legislator, said she’d never seen lawmakers treat witnesses so rudely. During testimony, Ayer rarely interrupted supporters but frequently reminded opponents that the committee had no plans to revisit the merits of the law. Katy Lesser, whose sister Maggie Lake used the law to hasten her death last month, and Oliver Brody, Lake’s partner, both addressed the committee. Seven Days last month chronicled Lake’s story. “The bill worked for us, for Maggie, for my family,” Lesser said. She encouraged the committee to continue the existing safeguards, including the 15-day waiting period. “I think the safeguards gave her and her family lots of time to consider her illness, her prognosis,” Lesser said. Others urged the committee to add provisions to the law, but Ayer said after the hearing she has no plans to do that. Few pharmacists have been willing to fill prescriptions, out of concern they could be held liable if something goes awry. Attorney General Bill Sorrell advised legislators in a letter that while he believes pharmacists are immune from prosecution, the law should be changed to make that clear. Because of a last-minute legislative compromise in which two senators insisted on limiting the state’s involvement, Vermont’s law includes only a requirement that doctors tell the state when they write a prescription. Ayer said afterward that Vermont’s small population and the low number of patients using the law would make that data statistically unsound.